After all the street food we had in Ipoh and Jalan Alor, N and I thought it’d be nice to have lunch at a proper restaurant for a change. 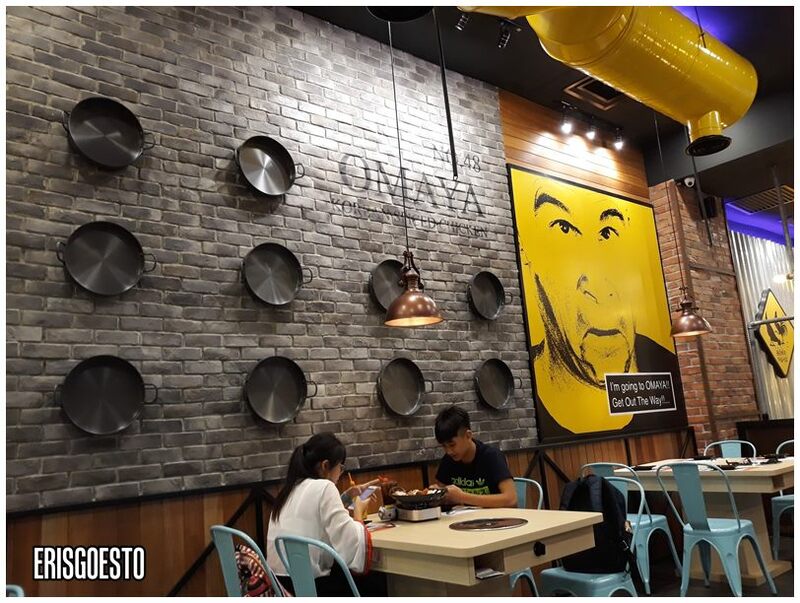 It was a toss up between Korean and Japanese food, but in the end, my craving for melted cheese prevailed and we found ourselves at Omaya in Pavilion KL, which specialises in items such as army stew and cheese dakgalbi. Korean food fans will know the brand well. First opened in Malaysia in 2016, there were crazy long queues when their first outlet opened in Pavilion Kuala Lumpur (the very one we were dining at!). 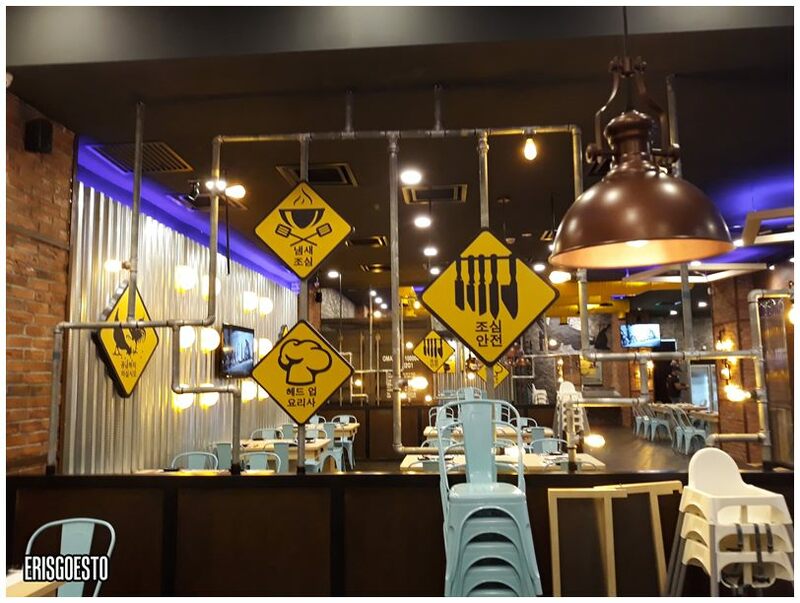 The restaurant itself has a predominantly ‘construction site’ theme, with black and yellow signs reminiscent of warning signs you find at a development project… except featuring woks, knives and illustrations of food. Steel pipes, silver aluminium-like sheets and bricks make up part of the decor. We ordered one of their specialties – the Army Stew or Budae Jjigae. 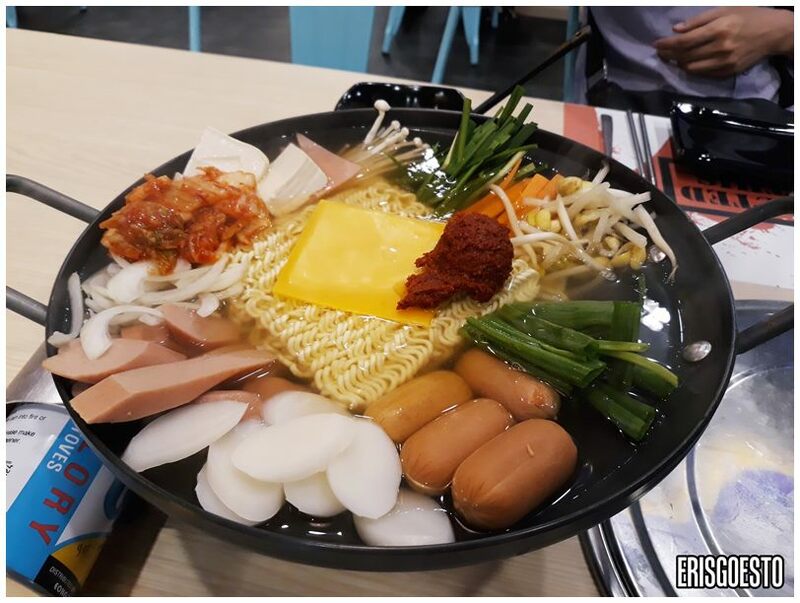 This popular hotpot dish contains a mishmash of ingredients such as ramyeon and kimchi, rice cakes, tofu, vegetables such as carrots, mushrooms and beansprouts mixed with processed foods like hotdogs, sausages and ham. It was said that the during and after the Korean War, when there was a shortage of food, locals would use scrounged or smuggled surplus items from US army bases, throw them into a pot and cook everything together – hence the name ‘army stew’. After mixing and bringing to a boil, the result was comfort food like no other – springy noodles that went well with all the different ingredients which lent the dish different textures and flavours, topped with a spicy kick from the gochujang (chilli paste). Although the version here couldn’t top the army stew I had at Gangnam 88 it was still pretty decent nonetheless. The real reason I came to Omaya – their Honey Mustard Chicken with Cheese. 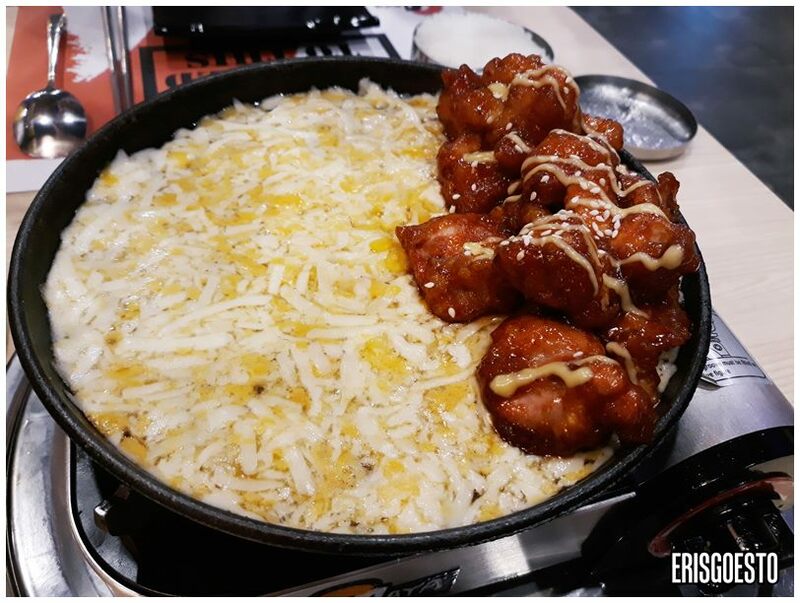 It came bubbling and frothing on a shallow pan which belied the amount of cheese on the plate. The chicken was sweet, salty and tender, but you have to wrap it up quickly if you want that gooey, stringy consistency. Cheese hardens after a couple of minutes, so work fast! Again, it was good but not awesome like ohmygodthisisheaven awesome. 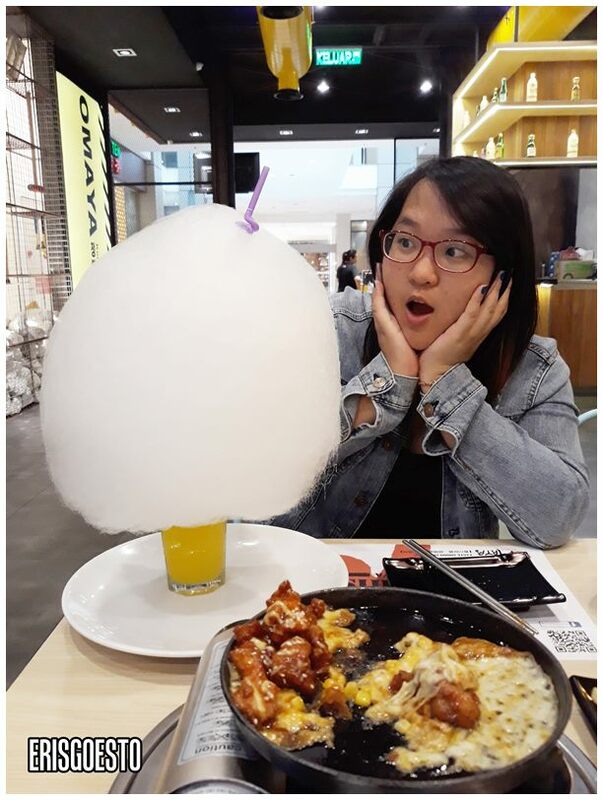 For drinks, went for the gimmicky Cotton Candy Shake: basically normal mango concentrate but topped with a giant cotton candy. Eat this quickly or it’ll sink and melt into the drink, which was what happened with mine lol. Price: above average; expect to pay Rm50+ for two persons. omg I see the cotton candy shake, just feel its sinking my teeth lol. Did it? yummy korean food that I love try, shall buzz my dear on this place now!